This is an absolute favourite of ours at the moment, and not my own recipe at all. In fact the recipe today has been taken from goodfood.com.au and was original written by Travis Mcauley. I make it as a side but end up enjoying it as my main. It really is a delicious summer eat. Blanch freekah and lentils separately in boiling water until both just cooked. Drain well and allow to cool. Mix the yoghurt, ground cumin and honey until combined. In a medium bowl, place the coriander, parsley, red onion, freekah, lentils, toasted nuts, capers, currants, lemon juice and olive oil. Mix well and season to taste. 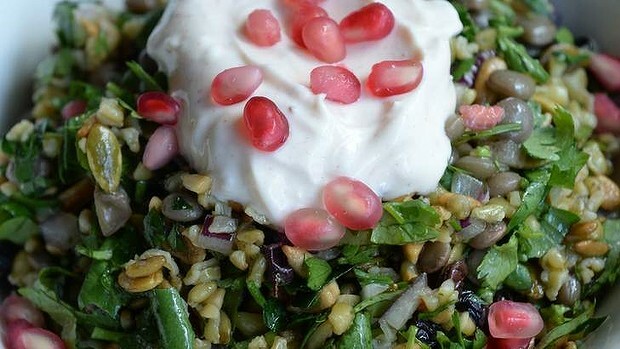 Place into serving dish and top with cumin yoghurt and pomegranate seeds. This entry was posted in What we're eating and tagged Family, Food, Health.